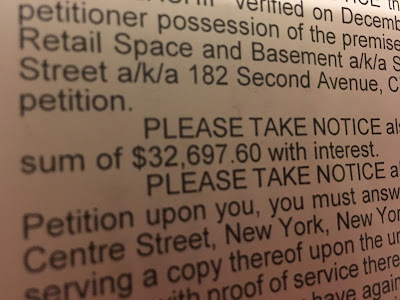 Yesterday, legal documents from the Civil Court of the City of New York arrived on the front door with a "Notice of Petition of Non-Payment" (aka the rent is past due). 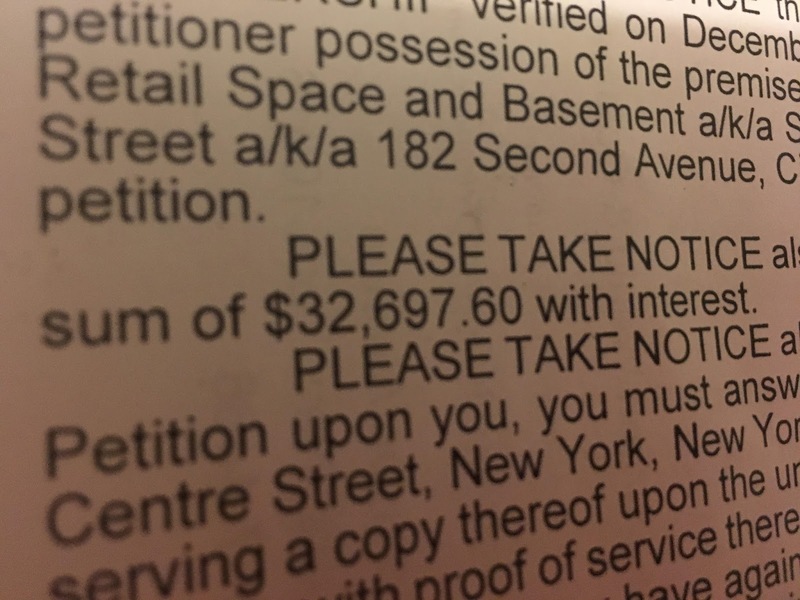 The balance goes back to July ... with the full amount of $6,489.60 due each month for rent since August, per the paperwork, which is dated Dec. 19. East Village Cheese moved here from Third Avenue in September 2015. By April 2016, regulars started worrying about the shop's longterm financial health. For good reason, as it turned out. That is one serious balance that is due. Wow. I hope they have good lawyers. Otherwise, if they are responsible for paying it, and don't, there will be a judgement looming over them, making it impossible to rent a home, get a job, and take a loan out. Better yet, they can also have their future wages garnished if they don't repay the amount owed. 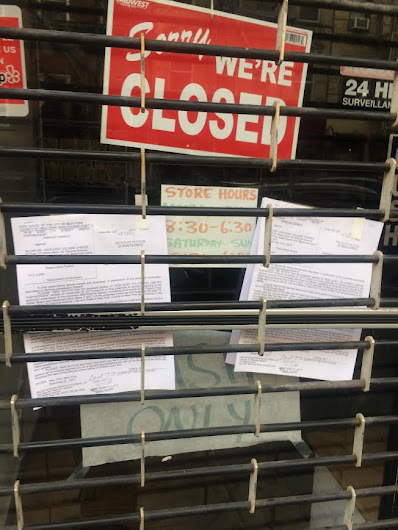 Granted this could all take months if not a year or two for things to fall into place, but it makes you wonder how anyone for that matter decides to open a business in this neighborhood without better business preparation. A storefront like this would have done better in the Flatiron or Financial District. Somewhere with a lot of foot traffic and people with money. No judgments toward anyone. But what was the business owner thinking? You would have to have at least a years worth of rent and expenses saved up in case of slow business/growth. Even then, it would leave you to wonder if it is worth keeping open. I think the state of businesses throughout NYC are evolving and diminishing. There is a lot of online growth within the retail realm. Lower operational costs in addition to social media branding one's product. In any event, RIP Cheese Shop. $6500 per month sounds like the low end for commercial rent. They must really have been in trouble to not be able to cover that. What a sad end to a once great business. I was a longtime customer at the 3rd Ave location and looked forward to visiting them on 7th St, but it was never the same. For one, their early closing hours meant I could never make it there after work, but the whole atmosphere changed and I didn't feel a good vibe inside the store. Can't really put my finger on it, but the spirit that existed in the 3rd Ave spot did not travel to the new location. I'm sorry to see them go, especially like this. Where were they before Third Ave.? Was it 1st Ave.? I can't remember. This was a business that had a great loyal client base and thought they would keep comming no matter how much worse the service and quality degraded. They drove a great store into the ground over a period of several years after taking it over. Now thats a lot of cheese to owe. Um. Presumably they were clever enough to incorporate in some form. East Village Cheese won't be able to get a loan, but the owners should be fine, depending on the riders in their lease. The cheese! Someone, please, save the cheez! @ anon 11:24 AM: They were on 9th Street between 2nd and 3rd, where Whiskers is now. Sorry Anon 9:26 AM I disagree, given the stock of cheeses they carried and their treatment of cheeses the store owners would not have been a success in the Flatiron or Financial Districts where people have more money. If you want to see what a good cheese shop is (and how $$$$ cheeses can be) go by the Bedford Cheese shop at 67 Irving Place. Also to other posters don't confuse the Tibetan owners of the last few years on Third Avenue and then on East 7th Street with the original owners who had the shop on East 9th Street and then moved to Third Avenue. What I think he or she meant to say, and perhaps they didn't say it well, was how the stability of business in a packed neighborhood, might be more profitable, and that a cheese shop of that size needs to have a huge following in order to sustain itself. I would have to agree. We're not talking about Bedford Cheese Shop. Or how they can conduct business. They aren't part of this discussion. The most important aspect of business in today's economy is getting the word out, be it with social media or branding or even a sale of some sort to keep bringing customers in. Location and visibility is everything. I visited the shop on 7th street last summer. The tone and vibe was somber and somewhat unfriendly. It certainly didn't echo the ambience or customer service of it's former address. Maybe they were just over it? It is a loss for our community nonetheless. Bedford Cheese Shop is unnecessarily expensive and unbearably pretentious -- a symbol of all that is wrong with the East Village today. The reason they failed is in the photo. They only accepted cash. That’s a business killer in the 21st century. What I do know personally is that I stopped shopping there before the move to East 7th Street because the quality of their cheeses had declined as did their prepared foods. And, as has been mentioned previously, the West Side Market, with its larger selection of cheeses and the high quality of cold cuts must have cut into their business. Places like Murray's and Bedford Cheese deal with cheeses, many of which come from small producers--hence the much higher prices and better quality. One of the changes in last decade or so (around NYC including the East Village) is that people have become more conscious of the food they are eating (the flood of organic fruits and vegetables in specialty shops as well as large supermarkets is a testament to this change). I think the owners of East Village Cheese, long before the move to East 7th Street, failed to recognize the changing nature of their clients and make adjustments. Even before the move I bought a few spoiled products in s row. After the move the place looked dingy and semi-abandoned and I was even less likely to buy. Instead, I've been buying more at Fairway--a bit more but so much better quality!